Do your PPC reports add value? Or are they just a list of numbers? If it’s numbers only, your days may be numbered because machines can do that part. But numbers alone are not enough, which is why strategy and insight are a key part of marketing reporting where you are needed. 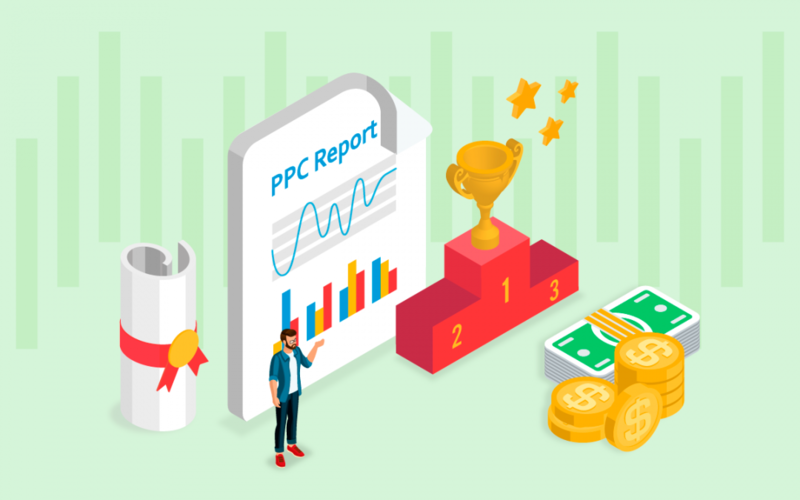 With a proper game plan, you can improve your PPC reporting practices and create PPC reports that add value by following the below steps. Before you jump into reporting and pull whatever numbers are available, first step away from the data to remember your goal. It sounds simple, but ask yourself why you run paid campaigns. By stepping away from the data, you have your primary goal in mind, and only then do you know which metrics are important. If your response is “we’re running campaigns to generate awareness”, clicks will be an important metric. With a new brand or new offering, you want to get people to your website. If your campaign is a lead generation campaign, you want to go beyond clicks and make sure you measure conversions. The awareness metric of a click is not enough for a conversion campaign. Have your primary goal top of mind before pulling numbers so you know where to focus. Direct conversions are a clear goal for lead generation campaigns, but those are tough to get in many industries. People often visit a site more than once before converting. Don’t assume a campaign that doesn’t have high conversions is not a good one. In addition to a primary goal of lead generation as your conversion, what is a goal that may lead up to it? A secondary goal, or micro conversion, indicates someone is getting close to converting. Your primary goal is where the money is, but you also want to have a secondary goal. For example, if people do not convert, but they spend time on your site and you have a low bounce rate, that might be a good indicator of them getting close. Or a visitor downloaded a paper, but didn’t make the appointment yet to talk to a sales rep. To identify a meaningful secondary goal, view behavior in Google Analytics for people who eventually converted and what they did on the site before converting. There is a lot of data available in every PPC platform but it does not mean you need to report on all of it. Look at your goals and your business objectives before deciding which metrics are the most relevant for you. Only when you have your goals in mind are you able to choose the appropriate KPIs. Your campaigns did not occur in a vacuum. With holiday campaigns, compare it to the previous holiday season. If there is a heavy marketing effort one month, including efforts other than paid campaigns, these different avenues could be working together. Be aware of the big picture and what is different from previous months with the marketing strategy for that business. The role of your stakeholders determines how much data to report. An executive may only be interested in a few numbers or a chart, but other members of the marketing team may want to have more information. Your finance person may only care about campaign costs. You may have a few different reports depending on who receives it so it could be something in-depth versus just a high-level overview. The different tools available offer templates with varying levels of detail. Before you select a reporting tool, consider drawing out the result you want. This isn’t anything fancy or complex that requires art skills. It’s as simple as taking a pen and paper, looking at the questions you’ve answered above and deciding if a chart, table or graph that will answer those questions. The goal is to know what you want first rather than first picking a tool and letting it dictate what you display. Consider your stakeholders and their roles. Google Ads offers predefined reports for basic data, with a simple drag and drop interface. Other platforms have similar capabilities for pulling data for that specific platform. If you want to pull in multiple data sources because you have PPC campaigns on multiple platforms, you can use data blending in Data Studio. This is useful for detailed reports when you want to see performance across different channels. 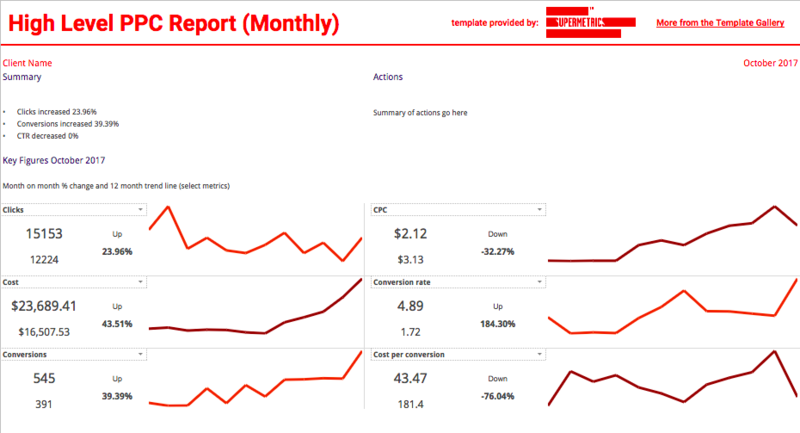 You can use a Google Sheets plug-in from Supermetrics to pull data from multiple platforms with report templates, such as the high level PPC report seen below. There are also templates to view paid channels at a high level, which are ideal for an executive update or with more detail to share with marketing team members. Pulling data with Data Studio, Supermetrics or another tool is the easy part. You tell the software to generate number and it delivers. This means reporting numbers in your role as an analyst is not enough. The machines can do that. Your role is to offer insight about the numbers and be clear on how it relates to the overall campaign goals. Start with three questions: 1) What worked? 2) What didn’t? 3) What will happen next? Some months, campaigns perform well and in other month, they may not. Be transparent and have a gameplan for what you will do next. This can also include suggestions on what the client may need to change, such as improving to a specific landing page or the website. Monthly PPC reporting doesn’t need to be a headache. Start by remembering the purpose of your campaigns before getting into the data. As you map out a plan for what to report and who you want to report to, only then are you ready to use a tool that will provide what you need. Think about what you need so you are not caught up in the bells and whistles available in reporting and letting the tool dictate what you report. The most important part of this process is the end where you offer your strategy and insights on the story discovered in the data. Keep your focus on those three key questions. What worked? What didn’t? What will happen next? Follow these steps and you are on your way to creating PPC reports that add value. Start your free trial of Supermetrics and start building better PPC reports today. Tina Arnoldi is Google Analytics and Google Ads Qualified and one of the few people in the United States recognized as a Google Developer Expert (GDE) for marketing. Her agency, 360 Internet Strategy, is also a Google Partner. You can learn more about her on LinkedIn.